For the first time since the recent crisis triggered by embattled Venezuelan President Nicolas Maduro's reelection to a second six-year term began which a dozen countries led by the United States condemned as "illegitimate", a high ranking general in the country's armed forces has defected while declaring loyalty to opposition leader Juan Guaido as interim head-of-state. 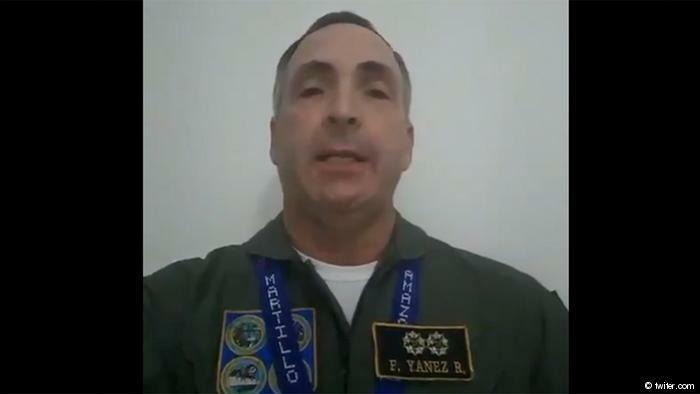 Air Force General Francisco Yanez, identified by Reuters as part of the air force's high command, published a short video via Twitter on Saturday wherein he called on Venezuela's armed forces to follow his lead in recognizing Guaido. Notably Gen. Yanez is identified on public state military information web pages as the air force's head of strategic planning, making him the highest military official to break from the Maduro regime in months. In the video Yanez urges other members of the military to defect in opposition to "dictator" Maduro's rule immediately as "the transition to democracy is imminent." He held up Guaido as the true president of Venezuela. His statement claims further that "90 percent" of Venezuela's military is against Maduro; however there's yet to be any signs of a mass waves of defections. "The people have already suffered enough", he says further in the video, describing famine-like conditions for lack of food and basic necessities such as medicine in the severely mismanaged and corrupt socialist country. "Do not repress (them) any more," he asserts. Also notable is that Gen. Yanez says "Mr Maduro has two planes on standby to flee the country" should his regime crumble, and Yanez follows by saying "he should go" as "the time for democracy is now." Meanwhile Caracas was quick to hit back, as the country's Twitter account for the Air Force's High Command issued an alert saying Yanez has committed treason. News of his defection came Saturday morning as opposition protests gained momentum across the country. This comes after opposition leader Guaido declared his willingness to accept the aid as "interim president" - despite the United Nations days ago reaffirming that Nicolas Maduro is the only legitimate head of state, contradicting the White House position. This raises the interesting scenario or possibility of the US initiating covert humanitarian shipments across the border, likely from ally Colombia, in defiance of Maduro's ban on such aid. And it further raises the question: how long until Syria-style US covert weapons shipments make their way into the "humanitarian" supply line?